Showing results for tags 'Lyra'. 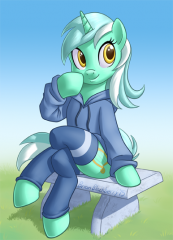 A new rp idea that I've been having bounce around my mind: Lyra's one true wish has always been to meet a real human ever since she 'thought them up' when she was a young filly. Others have called her weird and crazy for imagining such things, even her closest friend, Sweetie Drop aka BonBon, has seldom said so as well. She never lost faith, but only wished that the others would believe her. Throughout her filly years, she would continue to think about how it would be to meet a human; what they looked like, how they walked, how they talked, did they feel, how different where they from her and the other denizens in Equestria. One day, she found herself at Twilight's place, helping the purple unicorn filly with some type of spell that would allow non-unicorns to teleport where ever they wanted without the need of magic from themselves, which they wouldn't have. 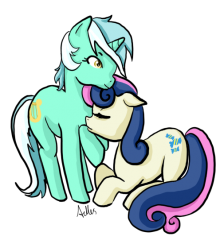 When the spell didn't seem to have any affect after the fifth attempt, Twilight gave up and thanked Lyra for the help. As Lyra left the library house, she came to the edge of the town and saw something unfamiliar near the outskirts of the Everfree forest. It was some kind of creature with lengthy legs, body, and a weird shaped head, and also wearing strange clothing. Lyra was both curious and cautious at the same time. The strange and unknown creature was sitting on the ground with it's back against the tree and head dropping down as if it was sleeping. After a moment, Lyra finally convinced herself to walk over and take a look. As she got closer, she noticed that there was more to this creature than she thought, notably what was at the end of it's arms. It wasn't hooves like what she had, but it nearly looked like claws of the timberwolves without looking sharp. As she looked over the strange creature, it groaned and slowly began opening it's eyes, taking in the surroundings. Lyra quickly took a step back and looked at the creature again as it was now waking up. Little did she know that her dream had finally came true; that she had met her first human. The question now was how did he get here, and how was he getting back home? This is the plot for the rp; Lyra meeting her first real human. 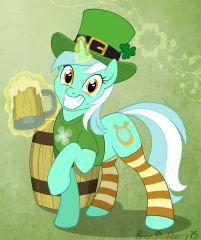 This rp is meant to capture reactions from Lyra, the human known as Hector, and the denizens of Ponyville and even Canterlot. If this is something that catches your interest, just leave a comment below and I'll start up the rp. (Note if you wish to participate you need to read THIS thread first and Register there<3) It was finally ready! QuickLime had spent hours and countless bits to arrange this! Advertisements everywhere! Guest Lists! Food Prep! Spa treatments! The whole nine yards! In fact the Lime coloured Pony was pacing in front of Town hall a little nervously, mane pulled up in a high Ponytail for the event, a hoof moved to push her glasses up and for a moment a little bit of dread washed over her! What if nobody showed? What if she was fooling herself!? Though she assured herself quickly she was being foolish... The Town Hall was all prepared! There was a table near the side that was loaded with munchies to tide them over till lunch! A big bowl of delicious sparkling punch, trays of puffed pastry bites with cream cheese and spinach, peanut butter balls rolled in roasted oats, carrot and celery sticks, small cucumber sandwiches, all sorts of lite spa food ! By that table was a station with assorted teas set up, along with several pretty porcelain tea pots, so that you could brew a whole pot of your favorite tea and take it over to one of the sitting tables and enjoy it with a friend! There was Coffee as well and a small bar that was set up, though right now it mostly contained fruit juices and sparkling water, since Lime felt that the REAL beverages could wait till later in the evening... She poked her head in real quick to make sure everything was in order, getting out her check list, checking again... and again... going upstairs, checking the bedrooms, coming downstairs, checking the spa equipment (Hoof Soaks, hoof polish, curlers, make up all that goodstuff) And finally checked out the quality of the sandwiches by snagging one and muching it, she snickered since they were perfect! After the clock struck 8 am she moved to unlock the doors and put out the welcome banner, waiting on baited breath for the guests to come in, Going to sit at the registration desk, she had made each guest a name card, as well as a small bag of goodies! There was a sign by the door that said ”Please Register at the Desk! And Welcome to EQGirlCon!” This was a little nerve wracking but Lime felt like she could DO this! 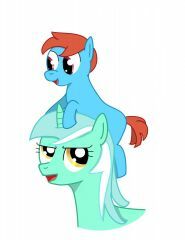 A Very Blue Day I'm Lyra Heartstrings, a unicorn mare, and I live in Ponyville. My best friend's name is Bon Bon, but we weren't always best friends. I wasn't always happy, either, but now I am! I hope this story will help whoever reads it to understand how I got to this point in my life. I guess I'll start with my time at Ponyville Elementary. 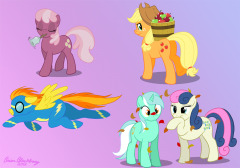 I didn't have any friends, see, because I was a blank flank, and everypony else already had their cutie marks! The popular fillies of my class were Trixie Lulamoon and Bon Bon. Trixie was a unicorn, like me, except that her coat was a darker blue colour, and she liked to wear this hideous purple cape all the time, I remember it had stars on it...I used to stare at Trixie and Bon Bon alot, wishing I could fit in with them... Bon Bon was a little nicer than Trixie. She was an Earth Pony, so she had no wings OR horn, and her mane was layered: dark blue, pink, and dark blue again. The ends were curly, and her tail was the same way. Her coat was a cream yellow colour, her cutie mark was three wrapped candies, blue and yellow--and I remember that because her eyes were a similar shade of blue, almost silvery or grey. Her eyes fascinated me, and often times I fancied they smiled at me, even when her face was a scowl of disapproval. I kept to myself, mostly, since nopony wanted to talk to me. I bent my head over my studies, and I really applied myself, but some ponies just aren't scholars, and so it was with me. I made passing grades, but just barely so. My parents suggested I join some extra curricular activity...and so began my career in music. My first instrument was a Triangle (yeah I know, right? Who buys their daughter a TRIANGLE?) but they weren't accepted in the school band, so I finally talked my parents into getting me a flute. Like everything else in my life at the time, no matter how hard I worked at music, I just wasn't any better than anyone else. I was just another cog in the machine, another notch in the tree. Another tree in the forest. But I was determined (and my daddy was determined) that I would become more than that. That I would become, if nothing else, the tallest tree in the forest. Or at least one that produced sweet-tasting fruit. I graduated elementary school, and moved on with the next phase of my life. I still attended band practise, though I would need to try a different instrument. I tried everything. 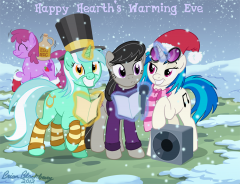 Music was my outlet, my way of venting all the terrible emotions I felt at the hooves of others. During my last year of schooling, the Band Teacher decided he would take a different approach, (I wasn't good enough to actually be in the band, I was a back up's back up for one of the celloists) and added to the band's arsenal a Lyre. (What is a Lyre? Well, it's a harp of sorts.) I remember that day better than any of the others. 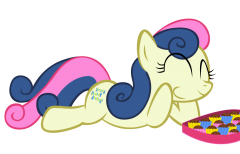 It was the day I got my cutie mark, which is also a Lyre. The sky was a deep curulean blue, not a cloud in sight. I entered the school building with my usual defeated sigh, for another day had just begun. I trotted down the blue-tiled hall, down a flight of cements stairs, and into the large, empty basement that was the entrance to the band room. A janitor's closet sat to the left of the door I entered through, and on the oppise wall was the door leading to the instrument room. My focus, though, was on the table in the middle of this first room. It was covered in sheetmusic, all of which pertained to Lyre players. And then I saw the Lyre. Bon Bon was holding it, and the rest of the class was gathered around her, the teacher giving instructions. The music coming from the thing in Bon Bon's hooves was like...nails on a chalkboard, if the pony dragging the nail down the board was also screaming because she had been lit on fire second before. It was horrible. And yet...something about that golden, U-shaped, diamond stringed instrument caught my eye. 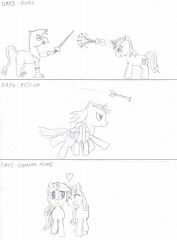 I took my place with the others, and everypony had a chance to play. Some of them made the music sound nice...but never more than that. Just..."nice". When my turn came around, I plucked the strings with the hoof not holding the instrument to my lap. The sounds was like...well almost like a rubber band pulled taut and then strummed; nothing special. The teacher rolled his eyes. As if he had been expecting anything different from "Loser Lyra". He told me I had tried my best, though his voice was so unconvincing, you didn't need to see him smile while the students snickered to know he was of like opinion about me. I wasn't ready to quit. I remembered seeing a unicorn gutarist once, during the Summer Sun Celebration. He had played using magic. I took a leaf from his book, and closed my eyes. My horn began to glow. I levitated the little harp out in front of me, and just...felt. I thought to the harp the raging torrent of my heart. It was as though I were a dam, and the harp an a crack which widened until the dam burst, and outrushed a powerful, gushing, moving song, designed to pull at one's heartstrings. The Lyre conveyed my sorrow to the room. The sound reverberated throughout the entire school, seeming to echo around inside me, coming from everywhere, and yet nowhere. I felt hot, scorching, bitter tears sliding down my cheeks, even when I opened my eyes to see my classmates were also tearing up...and smiling. Some were even clapping. I caught Bon Bon's eye as I played, and saw understanding. Her silvery eyes were shimmering with tears, and hers was the only face not smiling. She looked down. Her ears drooped. When I finished playing, I found a Lyre had appeared on my flank. It was my cutie mark. I smiled. A true smile, for the first time in my life. I had finally gotten my cutie mark! No one would have a reason to mock me, to scorn me anymore! I fit in. Bon Bon approached me after class. She was nervous, pawing at the floor with a hoof, and her ears still drooped. "Listen, Lyra," she said softly, "I...I'm sorry I never talked to you before. I really did want to be friends, it's just..." "Don't worry," I interrupted cheerfully, smiling at the Earth pony, "all that matters to me is, you want to be friends now." Bon Bon smiled then, not a really happy smile yet, but an almost smile. An I-could-be-happy smile. "So...what are you going to call that song?" she asked me. I thought about that. The song had been my life story, all tearing out of me at once. My life had been unhappy, but that was all behind me now, just as a bad day is behind you when the sun sets. "I think I'll call it...A Very Blue Day." I spent the evening tweaking my style a little. Trying out new ears and adding cheeks to forward perspective (okay so it’s more like 4/5 leave me alone!). Also trying a new way to do 1/2 perspective rather than drawing a circle, adding the nose and swooping down to form the jaw; drawing a circle, carving the nose inwards and collapsing the forhead. Featuring Rainbow Dash, Derpy, and Lyra. 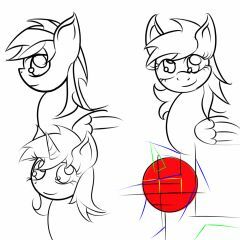 That uh… thing in the corner is sort of a measurement base I made for fun, the red circle is what I based the initial head circles on. Anyone’s free to take that line thing and practice on it. Black is for body and ears, blue is hair, green is accessory (horn/wings), and yellow is eye. 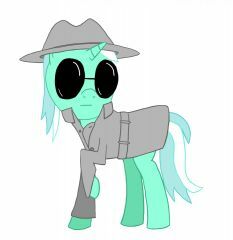 Lyra in disguise as "Incognito" from the Applejack kissing thread. Completely forgot to upload it here. Just a cute little picture.